Sciatica is typically caused in a patient when a herniated disk or a bone stimulates the spine pressing on the nerve. The pain starts off in the spine and spreads out down the back of the leg of the patient. Sciatica characteristically affects one side of the body of the patient. Medication for the pain in the spine and physical therapy are some of the common treatments for Sciatica. Best Ayurvedic Treatment for Sciatica in Hyderabad | Vardhan Ayurveda. In modern medicinal science, sciatica is treated with potent painkillers or with surgical intercessions, which have limitations and adverse side effects on the patients. Unlike modern medicinal science, Ayurveda poses a range of treatments like Basti Chikitsa Siravedha, Agni karma, and palliative medication to treat patients with sciatica successfully. Among all of these variations of treating sciatica, Agni karma is highly effective and provides timely relief. Agni Karma treatment consists of involvement of various metals like silver, copper, gold, iron, etc. for different stages of the disease conditions. In the present work, a comparative study of Agni karma by using iron, copper and previously studied Panchadhatu Shalaka in Gridhrashi (Sciatica)has been conducted. In current times, a relative study of the “Agni karma” was done by using metals like copper, iron, and the “Panchadhatu Shalaka” for sciatica. Twenty two patients were separated into three different groups and were treated for sciatica. The results were accurately monitored and studied. These results were very positive. 50% of the patients in group1 were treated successfully and were entirely relieved of the signs and symptoms related to the spinal nerves. Sciatica is a severely painful disease, which can be fatal at times. It also hinders the daily routine by inflicting regular pain. Anyone who is suffers from sciatica is somewhat handicapped. The patient won’t be able to sit, stand, and walk correctly because of steady sciatic pain in his/her limb. 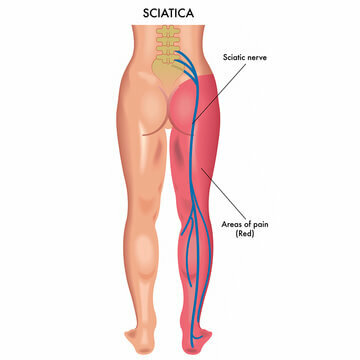 The main occurrence of sciatica disease is in the age group of 40 to 60 years, which is known as Vata Prakopaka Kala. The modern medicine cites that there occurs a decrease in hydration of the intervertebral disk with age. It leads to the cycle of degeneration process, which results in disk problems and causing sciatica (Gridhrasi). Females are more prone to get sciatica, since they do not take proper care while doing strenuous work and lifting heavy objects. Agni karma treatment is result oriented for sthanika connection of Vata in Vatakaphaja disorders. We at Vardhan Ayurveda believe in serving people, suffering from various incurable illnesses, with Ayurveda in a divine manner. It is very crucial to our inner being. We are fulfilled when our clients revert back to us by saying positive things about us. We have specialized doctors at our disposal to treat the patients with highest medical standards, personal care, regular monitoring and provide the best Ayurvedic Treatment for Sciatica in Hyderabad cure for these sorts of diseases. We are exceptional at providing sciatica Ayurvedic treatment.
" Ayurveda is the best approach for a successful treatment of Sciatica without surgery. "